The Board of Directors of the National Coast Guard Museum Association approved new renderings of the museum to be built in New London, CT. 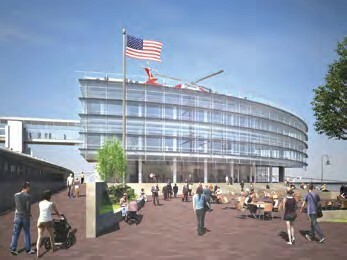 The 54,000 square foot, four-floor museum will take full advantage of its location in New London’s Waterfront Park by incorporating a pier for the U. S. Coast Guard Barque Eagle, and Coast Guard aircraft will be displayed on the rooftop. Architects from Payette and exhibit designers from Gallagher & Associates are in place to personify the United States Coast Guard of the past, the present and the future. The National Coast Guard Museum will honor the heroism of the men and women who answered the call to always be ready, as in the Coast Guard motto: Semper Paratus. Permanent and revolving multi-media exhibits will tell compelling stories of the past, the present and the future as they evoke the Coast Guard’s critical role and mission in maritime security, safety, protection of natural resources, and national defense. The museum will open in 2018 based on the raising of fifty million dollars in private donations to match the same dollar amount in government grants. For more information or to make a donation, contact the National Coast Guard Museum Association at 860-443-4200 or visit coastguardmuseum.org.